Open spaces, once rich with wildlife are shrinking. If this nation's wildlife heritage ever slips away, we will have lost more than something wild, beautiful and free - we will have lost a part of ourselves. Formed in 1984 by four concerned Montanans, the RMEF's purpose is simply to "ensure the future of elk, other wildlife and their habitat," avoiding political issues and debates. 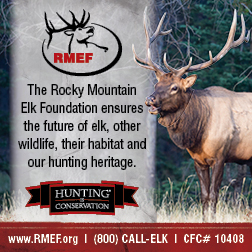 With over 150,000 members, the Rocky Mountain Elk Foundation has conserved or enhanced more than 5.4 million acres of habitat for elk and other wildlife. We have completed more than 6,054 acquisitions and habitat conservation projects in 49 states and 8 Canadian provinces.